Posts related to St Iberius’ Church. In 1887, a young boy named ‘Cogley’ found the figure shown in the image on the right near St Iberius’ Church, in the shallow waters of Lady’s Island lake. One evening in October 1649, a warning came that Oliver Cromwell’s troops were marching towards the church from Wexford to ransack and loot it, along with the nearby pilgrimmage site at Lady’s Island. 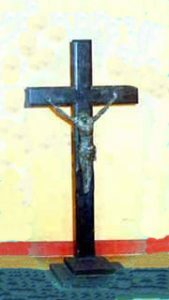 On hearing the soldiers were on their way, a local man named ‘Duffy’ ran to St Iberius’ Church and took the crucifix holding this figure from the church. Duffy fled across the shallow part of the nearby lake with the figure in a bid to rescue it from the clutches of the English soldiers. However, as he made his way across the lake, Duffy was spotted by the soldiers and shot dead. Duffy’s body and the relic he carried fell to the bed of the lake where it was concealed for over 200 years before it was discovered again by chance by the young Cogley in 1887. More details of this story can be found on the Our Lady’s Island parish website here. The tale was shared with us by Paul Doyle from Our Lady’s Island, who’s great-grandfather was the boy ‘Cogley’ who found the relic in the lake in 1887. The content below appears on the Norman Way interpretive panel at St. Iberius’ Church. St Iberius, or ‘St. Íbar’ as he was also known, was a very early saint in Ireland. His influence reaches back to a time even before St Patrick arrived in the country. The arch you can see on this site at waist-height is actually the top of a doorway into the old church. Over time, crumbling walls and grave burials have gradually raised the floor level inside this church ruin. There is a 19th century grave monument for a local surgeon on this site. It is not by accident that this grave lies within the boundary walls of the ruined church and on the highest point. This demonstrates the doctor’s importance in the eyes of the local community. From this high vantage point, see if you can spot the swans and terns that nest in the reeds on the edge of the lake which surrounds Lady’s Island. Lady’s Island is the site of a Norman settlement and is designated a Special Protection Area by Ireland’s National Parks & Wildlife Service. It is the country’s largest sedimentary lagoon with a sand or shingle barrier and contains a variety of breeding wildfowl species along with a number of rare plants.